This is a sponsored post as part of the Mom It Forward Blogger Network and the National Frozen & Refrigerated Foods Association. As always, all opinions are my own. Planning a recipe for holiday parties can get overwhelming, especially if you have a lot of parties to go to and not a whole lot of time to dedicate to making something from scratch. One thing I have learned is that the frozen food and refrigerated dairy sections of the grocery store are full of items that can make cooking for the holidays easier than ever (you can pretend you made it all from scratch...your secret is safe with me)!! With just three ingredients from the frozen and refrigerated section, I put together a wonderful dessert that the whole family loved! I think it might be my new go-to recipe for our holiday parties. 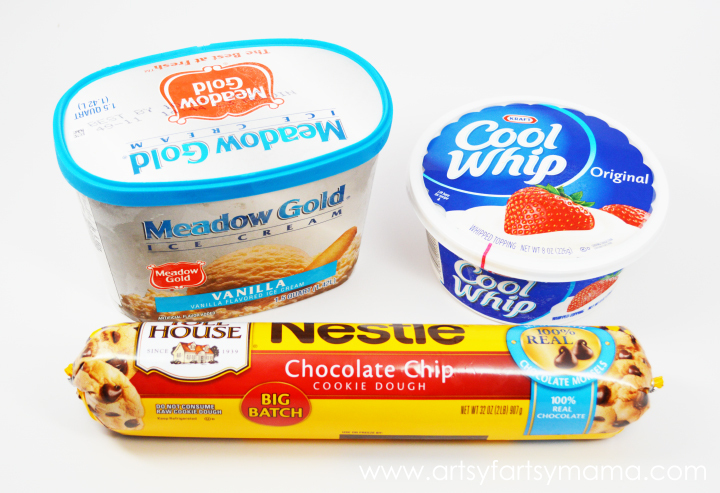 Both the ice cream and the whipped topping can be found in the frozen food section, while the cookie dough is in the refrigerated section. Lightly spray a 10 inch springform pan with nonstick spray and press the cookie dough into the pan. Bake at 325º for 20 minutes. Let cool completely. Once cookie has cooled, let the ice cream soften (but not melt), and scoop it into the pan. Spread evenly over the cookie, then place back in the freezer to harden the ice cream up again. Once the ice cream is frozen, top with refrigerated whipped topping. If ice cream is melting, refreeze for about 30 minutes. Carefully remove the pan ring and run a sharp knife under hot water. Cut pie into slices, and serve immediately. Top with any of your favorite sundae toppings. *Tips: freezing the cookie may make it hard to cut. Be patient and it will thaw. You could also make the cookie in a separate springform pan, freeze the ice cream in another, then put together when ready to serve so that the cookie is at room temperature. For more meal and dessert recipe inspiration, visit www.EasyHomeMeals.com, The Dish Diary Tumblr, and follow Easy Home Meals on Facebook, Twitter, and Pinterest. You can also learn more about the National Frozen & Refrigerated Foods Association at www.nfraweb.org. Yum- what a great idea! And so easy! 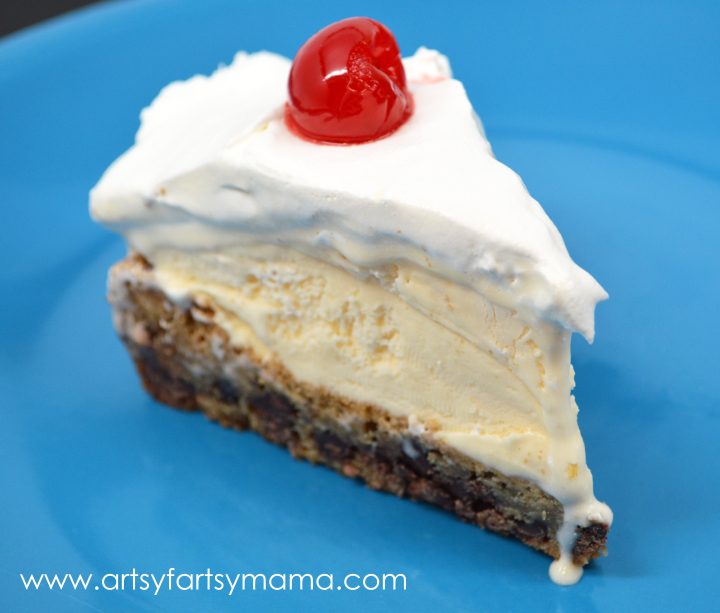 I've never pressed cookie dough to create a crust- will have to try it for a special treat for my boys! Some days I just need an easy dessert idea an this looks perfect! Thanks for sharing :) Pinned while I was here tonight! Sounds delicious! Like a frozen pizookie. Love how simple and easy it is. I can't tell you how glad I am that there's not a piece of this fantastically irresistible-looking pie sitting in front of me right now! lol Too yummy for words! Looks yummy. My daughter would love this!! This looks delicious! I can tell you that it would be a huge hit in my house! OMG this is awesome, Lindsay! My kind of recipe..easy, few ingredients, and YUMMO! Thanks so much for inspiring me today! Oh, YUM, Lindsay!! I want some right now!!! I'm totally dying over here! I love icecream and this looks like a perfect treat for the holidays! Oh my sweet mercy, this looks so fabulous! Three of my favorite things combined into one awesome recipe! YUM!